The Peugeot RCZ is a bid to challenge the Audi TT. Peugeot has announced that its RCZ coupe will go on sale starting next spring after its debut at the Frankfurt auto show in September. The 2+2 coupe is Peugeot's attempt to challenge the Audi TT. Based on the 308 hatchback, the RCZ was shown as a concept at the Frankfurt show in 2007. 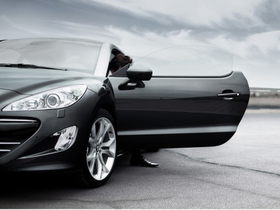 The RCZ will be targeted at driving enthusiasts and aims to boost the emotional appeal of the Peugeot brand. "The choice of the RCZ name symbolizes its special and unique position within the Peugeot range. It is the first car which does not use the usual zero or double zero numbering system," Peugeot said in a statement. The first official pictures show how the production car will retain much of the concept's proportions, with a 308-style nose and almost identical light clusters. The RCZ likely will be powered by same the 1.6-liter turbocharged engine, with an output of more than 200hp, used in the Mini John Cooper Works. A diesel alternative is also likely, using a new-generation 2.0-liter HDI unit generating up to 163hp. The 308 RC Z concept car from the 2007 Frankfurt show.